Two mutations inTetranychus urticae and nine inTetranychus pacificus, all originating spontaneously, block the production of red and yellow carotenoid pigments in these spider mite species. 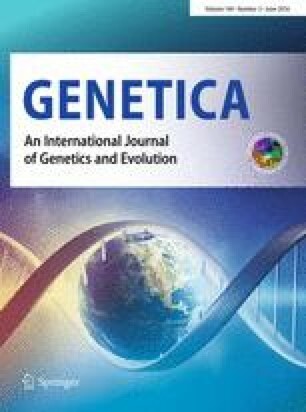 Inter-mutant crosses were carried out to study complementation and recombination relationships between the mutations. InT. urticae, the two albino mutants complement one another completely, i.e., crosses between them produce wild-type hybrid females; while they recombine with a frequency of 0.05%. Of the nine mutants inT. pacificus, fivep mutants in general are complementary to a high degree with foura mutants.p mutants fail to complement one another, while somea mutants are mutually complementary to a slight degree. Scoring the degree of complementation produced by all possible combinations of mutants permits the construction of a linear complementation map. Certain combinations, however, are exceptional to such a representation. Moreover, marked reciprocal differences in complementation indicate that maternal effects are involved, implying that the albino locus may control more than one enzymatic step. Attempts to derive a genetic map were impeded by the absence of suitable linked markers, by a pronounced maternal effect (high pigmentation) in the haploid F2 males, and by the appearance of “pseudowild” type F2 males. The given genetic sequence, although comparable in a limited fashion to the complementation map, is considered tentative. “Pink” types appeared in crosses with certainp mutants. These were due to mutation at a separate locus, called “rose”, and seem to involve the production of pink pigments in an alternative or substitute pathway. A scheme attempting to orientate the present state of understanding of pigmentation in spider mites is presented. This work forms part of a thesis submitted in fulfillment of the requirements for the Ph. D. degree at the University of Amsterdam (1969).